It’s one thing to read about Linux, but it’s another thing entirely to use it. If you are just getting started or have some newfound Linux knowledge that you would like to put to the test, you’ll need a shell account. Luckily, getting an account on a Linux server is fairly easy. The absolute quickest way to get access to a working shell account is to visit SimpleShell in your web browser and click “Start my session.” A terminal emulator that is connected to a Linux server will be displayed. You will be automatically logged in using a generic account and presented with a shell prompt. Since you don’t have a personal account your shell history and any files that you create will be destroyed at the end of your session. SimpleShell is great for trying out a few commands or working for a short period of time since sessions are limited to 15 minutes each. You can easily start another session at the end of your 15 minutes, but just be aware that you’ll lose any work from the previous session. Webminal is similar to SimpleShell, but with some additional features. You are required to create an account before you can use Webminal and your account persists between sessions. This means that your shell history and files remain intact and are waiting for you when you return. If you plan on writing shell scripts Webminal is a better choice than SimpleShell. You are limited to 1 MB of storage space, but if you are learning Linux commands and writing shell scripts, that is plenty. LinuxZoo is yet another option. Like Webminal, you are required to create an account before you can use their service. Instead of getting a normal user account on a Linux server, you get access to the root account on a Linux virtual machine. It’s great for testing commands that require superuser privileges to run. Sessions are limited to 20 minutes and the virtual machine is destroyed at the end of that time. There is no picking up where you left off with LinuxZoo. SimpleShell – No registration required. 15 minute session limit. Webminal – Registration required. Account persists between sessions. LinuxZoo – Registration required. Root access. 20 minute session limit. If you use a web hosting service to host your website you may already have a Linux account that you can use. Consult your hosting company’s documentation and search for “SSH” or “shell access.” If you don’t already have a web hosting provider, you can sign up for one and use it for shell access. Shared web hosting providers typically charge just a few dollars a month. Professional web hosting for $6.95/month. Here are some shared web hosting companies that can provide you with a shell account and SSH access. You can request a free Linux shell account at BlinkenShell. However, you have to jump through some hoops like waiting a minimum of 24 hours and asking for people in their IRC chat room to vouch for you. You can also get free shell accounts on SDF, CJB, and Devio.us but they won’t be Linux accounts. SDF is NetBSD, CJB is FreeBSD, and Devio.us is OpenBSD. Since the BSD descendants and Linux are all Unix-like operating systems there is a lot of commonality. BlinkenShell – Linux, but you have to wait for access. VirtualBox is virtualization software that can be installed on Windows, Mac, Solaris, or Linux. 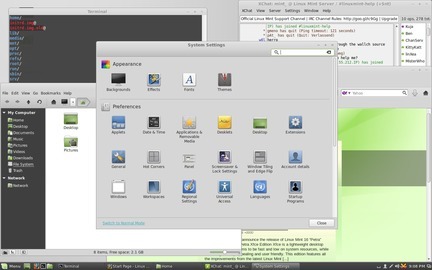 It allows you to run an operating system (guest) inside your current operating system (host). In this scenario you will spend a few minutes installing the virtualization software, downloading a pre-installed Linux image, and importing that image. To get started, head over to the VirtualBox download page and grab the installer for your current operating system. Click through the install screens and accept the defaults. Here’s a video that walks you through the process. Next, download a virtual disk image (VDI) to use. If your goal is to eventually become a Linux system administrator, download a CentOS or Ubuntu image. CentOS is a Red Hat Enterprise Linux (RHEL) derivative. As a general rule, CentOS and RHEL are often found in corporate environments. Ubuntu is popular with startups and smaller companies that run their operations in the cloud. Honestly, you can’t make a wrong decision. The concepts are the same, but the implementations vary slightly from distribution to distribution. If you can do something on one distro, you can surely figure out how to do it on another. Launch VirtualBox, create a new virtual machine, and use the virtual disk image that you just downloaded. When you are asked for a hard disk image select the “Use existing hard disk” radio button and click on the directory icon. Next, click “Add” and select the virtual disk image. When the virtual machine is powered on you can log into the server using the username and password provided with the downloaded image. To recap, here are four easy ways to get access to a shell account today. Read the “Create, Build, Test Drive, or Deploy Your Very Own Linux Server with Full Root Access” article for even more ideas.